w/c 18th July 2016 ~ No classes all week as Yvette is away in Scotland for a wedding. Tuesday 26th July ~ No Renhold class (2-4pm) as Village Hall being repainted. This Thursday's Love to Dance class at Biddenham is cancelled as the Pavilion is having redecoration works. Your are warmly invited to attend tomorrow morning's class at Cardington Village Hall (Wednesday 10:00-12:00 Cardington Village Hall, Southill Rd, Cardington, MK44 3SX.) where we shall be doing Week 2 of the Rumba Flamenca from Spain. Happy New Year to all my dancers! Are you ready to go 'Around the World'? It's a surprise tour, so you'll have to come to class to find out what dance style we're doing, I'll be giving away no clues! We had a brilliant start to the year with lots of familiar faces returning to dance off their Xmas dinners. We've definitely moved some mince pies with this fortnight's Merengue! This dance has given my legs and arms an amazing work out. I've got calf muscles like tennis balls and tightened up my bingo wings! We got fruity at Cardington Love to Dance class! Tucking into delicious (and nutritious) fruit kebabs during the break, brought in by Marion. Yum yum! It's been nice to get away from the damp, cold British weather for two weeks with a Latin American dance style from the gorgeous country of the Domican Republic. If you're over 50 years old, live near Bedford and want to try something fun and new then 'Love to Dance' classes are for YOU! 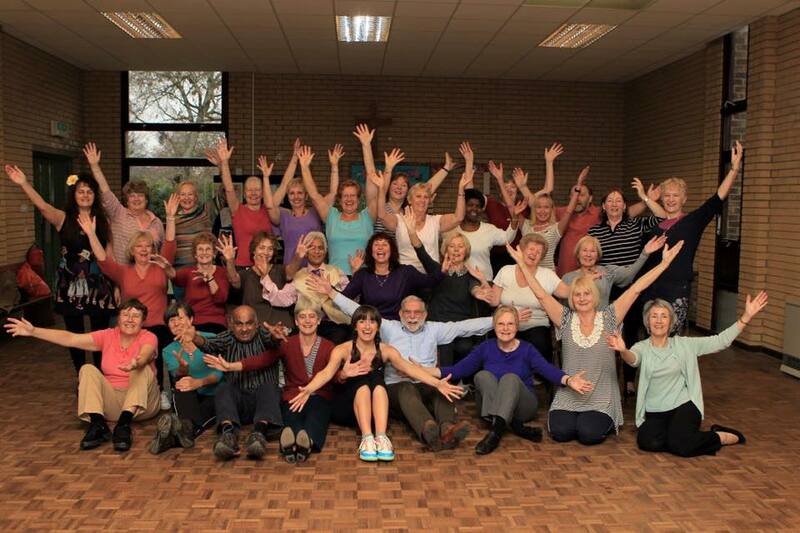 Here's a group of Love to Dancers I used to teach in Royston back in 2011 doing a fab-u-lous job of the Merengue. On Tuesday I left my Love to Dance class in Renhold at 4:10pm. Hit traffic on bypass due to major crash, took diversion and drove round Houghton Conquest route to get round to Kempston. Had to stop at interchange park for a wee as had been in car for over an hour. Toilets out of order at Costa & TKMaxx so finally went in Macdo's. Half an hour later I finally got through the traffic lights and made it round the corner to Busy Bees nursery to collect Nyah. Decided to abandon the car and walk home with Nyah in buggy which took just 15 mins instead of goodness knows how long. Just thinking myself lucky that I am home safe with my family unharmed and hope all of my dancers got home safely too. The Merengue has been a real mood enhancer and it's been wonderful giggling and laughing with you all. It's time to say "Adios" to the Dominican Republic. 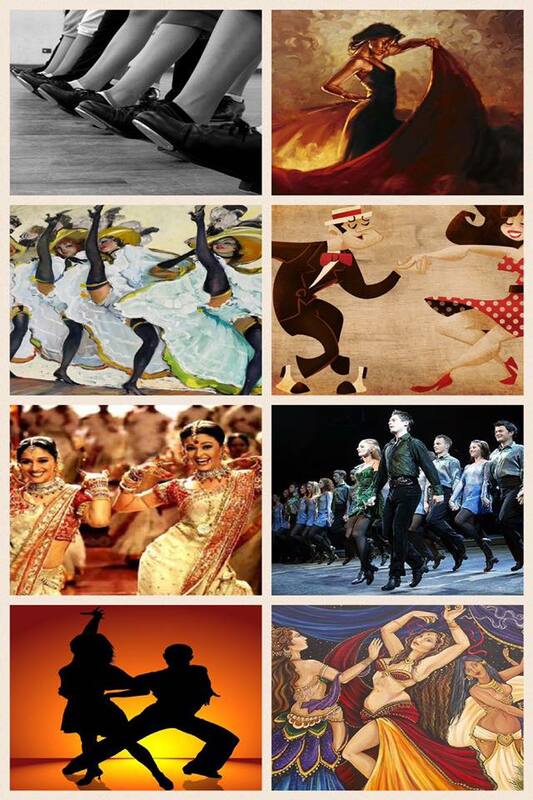 Where next on our tour of dance Around the World? It's a surprise! You'll have to come to ‪‎Love To Dance‬ class next week. I hope you enjoyed today's Christmas lunch at Bellini's? It was so wonderful to have 3 of my Love to Dance groups come together to socialise and be merry! I wish you all a very Merry Christmas and a Happy New Year. The first class back at Cardington Village Hall will be Wednesday 6th January 2016. If you can't wait until then, I shall be singing at The Three Tuns in Biddenham on New Year's Eve. Love to Dance class at Cardington cancelled today 9/12/15 due to short notice building works. Oh, it's been a proptastic week! 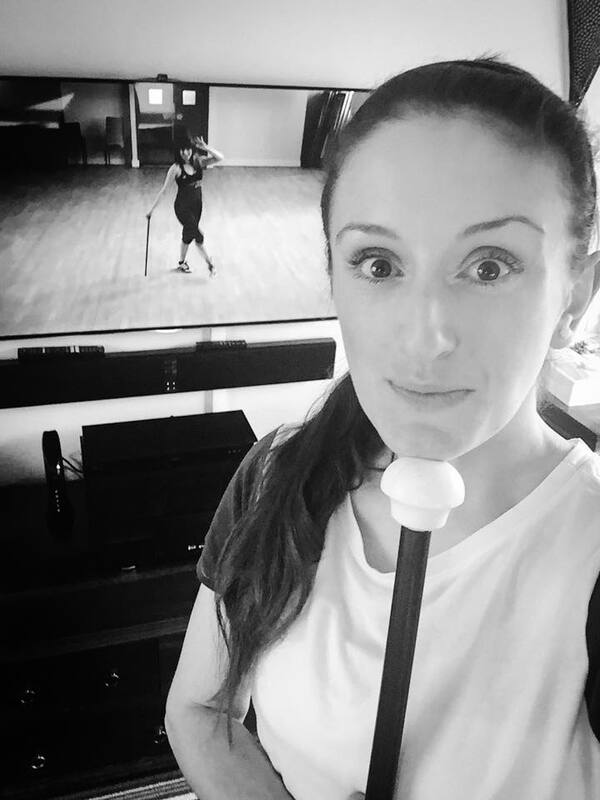 Dancing with a cane has created a whole new challenge for us as dancers, it's like learning a choreography with an extra limb! I started the week rehearsing in my living room with a cane and my younger self on the TV for this week's Gershwin number that I originally choreographed back in April 2012. 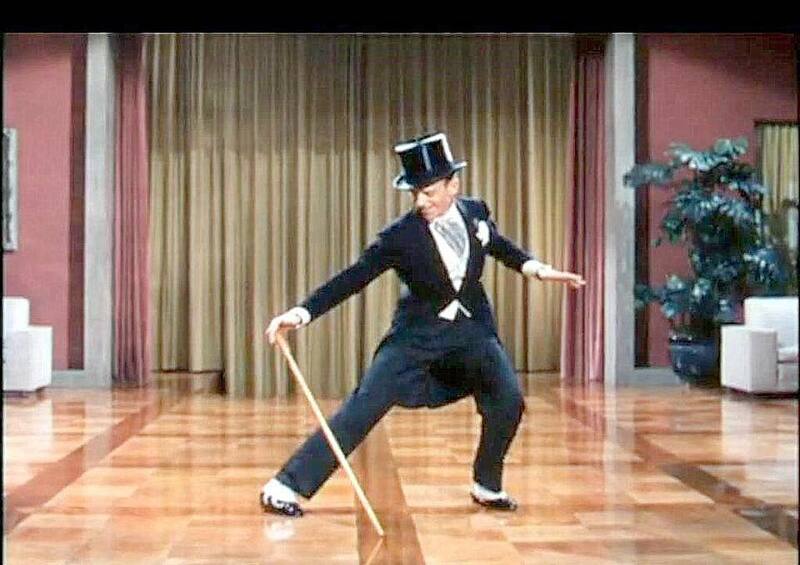 The dance is of no specific style but has a feel of 'American Smooth' with tap dance/soft shoe shuffle. 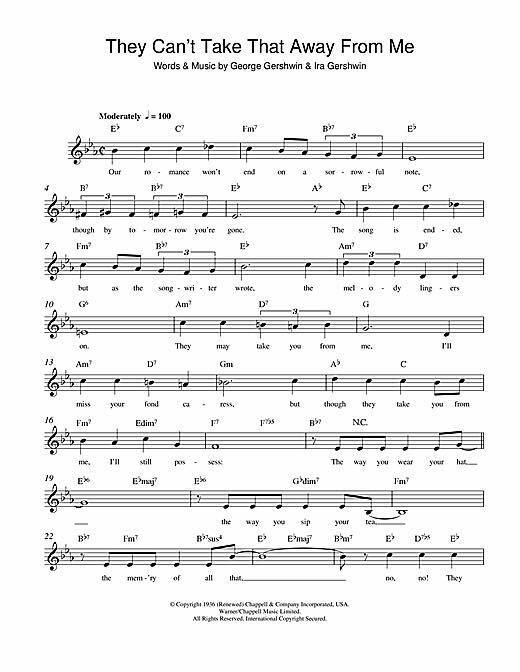 It has a real melodic flow, following the lyrics written by Gershwin and sung by Frank Sinatra. I thought 25 dance canes would be enough... It was - just! A fabulous 25 dancers attended Tuesday morning's class at Stotfold Memorial Hall despite the weather warnings of storm 'Barny'. I had to teach the routine with a dusty old broom as there were no canes left! For some reason dancing with a cane creates far too many innuendos... I really must try to maintain my composure at next week's dance classes. (Had a great giggle this week though!) I suppose any stick used in dance, no matter how you dress it up, is going to be seen as a phallic symbol! As I was going back in time looking through my dance archives for this routine I came across a wonderful photo ‪taken in‬ 2011, when I was teaching in Letchworth. Still have a few of these lovely faces coming along to dance with me in Stotfold 4 years on. It's great to get to know you all, some of you I have known for years now! I love some of the chats we have during our tea breaks at Love to Dance. Sometimes we talk 'Strictly', other times it can turn all deep and meaningful, sharing life stories, telling jokes, or just having a good old gossip! I am proud to announce that this week saw the highest total attendance over all four groups at Love to Dance since March! That's a brilliant achievement as generally November is not a good month for motivation, with the weather turning colder and the days getting darker. I hope to keep dancing with you on the run up to Christmas and then look forward to 2016 when we'll be dancing Around The World! Friday 11th December, 12pm at Bellini's Restaurant, 44-46 High Street, Clapham, Bedford, MK41 6EG. 3 courses + tea/coffee £20. 	SPICOLA SAN DONATO – Fillets of seabass with cherry tomatoes in white wine served with roast potatoes & seasonal vegetables. 	POLLO BELLINI – Breast of chicken cooked with mushrooms & cream served with roast potatoes & seasonal vegetables. 	RAVIOLI AL POMODORO – Pasta parcels filled with ricotta cheese & spinach, cooked in a tomato sauce. 	CHRISTMAS PIZZA – Stone baked pizza topped with tomato, mozzarella, turkey & sweetcorn. Selection of coffee & tea with mints/biscotti. To confirm your reservation please return your completed menu selection with the full £20 payment to Yvette by Friday 27th November. Friday 4th December, 12pm at The Stag, 35 Brook St, Stotfold, SG5 4LA. 	TUSCAN TOMATO & BASIL SOUP served with crusty bread & butter. 	BAKED MINI CAMEMBERT served with warm crusty bread. 	SPICY MINI CRAB CAKES served with salad & sweet chilli sauce. 	ANTIPASTI inc. prosciutto, salami, chorizo & cured pork. 	FETA & OLIVES served with warm crusty bread. 	ROAST TURKEY OR BEEF served with roast potatoes, roast parsnips, seasonal vegetables, Yorkshire pudding and gravy. 	SLOW BRAISED PORK SHOULDER IN CIDER served with new potatoes and seasonal vegetables. 	COD & SOUR CREAM BAKE served with sauté potatoes, peas and corn on the cob. 	GAMEKEEPERS PIE served with seasonal vegetables. 	WILD MUSHROOM & CHESTNUT PIE topped with mash and served with seasonal vegetables. 	CHRISTMAS PUDDING served with brandy sauce. 	CHOCOLATE PRALINE TRUFLES served with cream or ice cream. 	STRAWBERRY & CREAM CHEESECAKE served with cream or ice cream. 	PEACH MELBA CRUMBLE served with cream or ice cream. To confirm your reservation please return your completed menu selection with a £5.00 deposit to Yvette by Tuesday 24th November. You are invited to join Yvette and your dance friends for Christmas lunch. Stotfold Group's lunch shall be on Friday 4th December, 12pm at The Stag, 35 Brook St, Stotfold. SG5 4LA. 3 courses £16.95. Renhold, Cardington & Biddenham Group's lunch shall be on Friday 11th December, 12pm at Bellini's Restaurant, 44-46 High Street, Clapham, Bedford, MK41 6EG. 3 courses + tea/coffee £20. Please collect your menu pre-order form from Yvette at your next class.